Already, people are clamouring to write the next big hot take on the Nintendo Switch, and it’s not even out yet. Will it sell? Will it bankrupt Nintendo? Will it be such a colossal failure that we have to just scorch the earth and move to a whole new planet that’s never even heard of the Virtual Boy? Probably not. Nintendo have made mistakes, but they’ve also made some incredibly smart business decisions. People love to talk about the failure of the Wii U, but rarely about how successful the 3DS was – 65 million sales as of January 2016, almost three times as much as the original Xbox. The DS, which came before, sold 154 million in its lifetime – the second-best selling console of all time, behind the PS2. So what about the Switch? Will it be more like its home console predecessor, the Wii U, or its handheld predecessor, the 3DS? Nintendo have cleverly positioned the Switch as something in-between, which is at once going to attract and scare away customers. The 3DS was great for more casual gamers and for women, with games like Animal Crossing, Nintendogs and Harvest Moon appealing to both markets, whereas the Wii U tended to err on the side of larger, more intense games, as well as party games. The Switch, hopefully, will combine both worlds: a handheld for the people who want handhelds, a home console for people who want home consoles. Of course, there are some that want both, and that’s all good, too. But it will potentially intimidate those who aren’t as au fait with the gaming world as the people who buy consoles on launch day no matter what they are. The marketing shows people taking their Switch to parties, to makeshift basketball courts under railway bridges, they notably didn’t show people playing on the toilet, but they totally will. But who is this aimed at? I don’t know a lot of people, into gaming or otherwise, who take their consoles to parties. Perhaps the Switch will change gaming, the way the Wii did back in 2006 with its motion controls, or the way the Game Boy changed portable play. Maybe in a few years, we’ll all be carrying our consoles round and going to cool parties. It’s already seemingly got more support than the Wii U had at launch, when everyone seemed a little skittish about what the GamePad was for, exactly. Snipperclips, an indie-turned-first party game, was shown off at the official Nintendo Switch preview event, and other indies are also coming to the platform: GoNNER, Tumbleseed, Stardew Valley, RiME, Shovel Knight, Snake Pass and so much more. This huge list of games, alongside larger games like Zelda, Skyrim, Minecraft and Mario, will give players a huge range of things to try out with the new console, whether they get invited to cool parties or not. 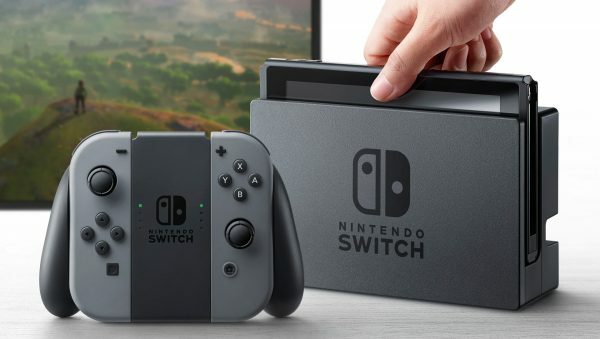 It may be that people are slow on the uptake with the Switch – especially with the £300, which is higher than most expected, and quite a lot for a totally new style of console – but I remain hopeful that after a month or two of people being unsure, the Switch will take off. Maybe it won’t sell as many as the PlayStation or Xbox, which are traditionally more universal gaming consoles than Nintendo’s tend to be, purely because Nintendo tends to lean harder on hardware gimmicks, but I still think it’s got a chance to be something great. I personally won’t be taking my Switch to parties. But I’ll be taking it on trains, planes, car journeys, and – yes – to the bathroom. I can’t wait to play a full-sized Zelda game in the bath (not advised, but I’m still going to do it). I’m looking forward to playing Skyrim in the park. Gaming has never been this portable before, and if Nintendo knows what they’re doing, the Switch could change the way we play – all over again.